Bring yourself to Kenya and find exotic wildlife animals at Tsavo East National Park, Amboseli National Park, and Tsavo West National Park. This safari is specially designed to give you the best safari experience and make sure that you will leave Kenya with plenty of memorable memories. Keitee Safaris will give you the highest level of comfort possible at an affordable price. You will get closer to nature and relax in Kenyan wilderness which will help you to refresh your mind. Children policy: Children from the age of 2 years are allowed to participate under the supervision of a parent or guardian. You will be accommodated at Voi Safari Lodge in Tsavo East National Park on day one, AA Lodges in Amboseli National Park on day two, and Ngulia Safari Lodge in Tsavo West National Park on day three. Voi Safari Lodge is within easy reach of Tsavo East and Tsavo West National Parks. It is also an ideal location for exploring the Taita Hills, including the highlands around Wundanyi, which have lovely views all the way to the coast. The lodge is affiliated to nearby Ngulia Safari Lodge and to Mombasa Beach Hotel. Packages which combine the 3 lodges are available from Kenya Safari Lodges and Hotels.On a hillside overlooking Tsavo East National Park, Voi Safari Lodge makes a lovely place from which to watch the wildlife and birdlife of the park. From the lodge, 3 waterholes are visible so guests can see animals coming to drink without leaving the lodge. AA Amboseli Lodge is Built in a three-tier architectural design and is strategically located 2km from Amboseli National Park main gate (Kimana Gate) and conveniently within the Emali-Loitoktok tarmac road. It is 240 km from Nairobi, 16km from Amboseli airstrip, 20 km from the Emali-, 20 km from the Emali-Loitoktok tarmac road and commands a panoramic view of the snow-capped Mt. Kilimanjaro, the world’s highest free Standing Mountain.With a total of 98 rooms, the lodge is intimate and friendly with many personal touches. Ngulia safari lodge is located in tsavo west national park with 52 rooms facing the vast wilderness and en-suits bathrooms facilities. Ngulia safari lodge is one of the lodges with a great view of Kilimanjaro and overlooking the famous Rhino sanctuary which is the largest in the world hence guaranteeing encounter with the rare African animal. At 06:30, you will be picked up from your hotel and be driven to Tsavo East National Park. You will enter the park through Bachuma Gate or Sala's Gate and then proceed with a game drive en route to Ndololo Safari Camp for lunch. 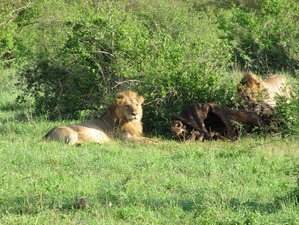 After lunch, you will have another game drive in search of the red elephants, buffalos, antelopes, and many other animals including the cat's family. Afterward, you will arrive at Voi Safari Lodge for checking in, dinner, and overnight. After breakfast, you will drive along Mombasa or Nairobi Highway to arrive in Emali town for a short break before proceeding over Amboseli National Park. You will stop at Maasai market on your way to AA Lodges for lunch. Amboseli National Park is home to the famous Maasai tribesmen where a visit to Maasai village would be optional. An afternoon game drive with good weather will give you the possibility to see the snow-capped Mount Kilimanjaro. Dinner and overnight will be at AA Lodges / Camp in Amboseli National Park. An early game drive in the park will give you the possibility to see the snow-capped Mount Kilimanjaro when the weather permits, as well as herds of elephants, hyenas, lions, and cheetahs in a morning hunting spree. You will then return to the lodge for breakfast, join the 09:00 convoy to Tsavo West National Park, and make a stop at Shetani Lava Flow for a brief history of this geographical feature which dates back to more than 500 years ago. You will check in at Chyulu Gate and proceed with a game drive to Mzima Springs where you can see fishes, crocodiles, hippos, and other aquatic animals from an underground observation tank. Later, you will proceed to Ngulia Safari Lodge for lunch. Your afternoon game drive will include a visit to a rhino sanctuary before returning to the lodge for dinner and overnight. You will have breakfast and thereafter proceed with a game drive en route out of the park for lunch. After lunch, you will proceed over Mombasa and arrive at your beach hotel in the evening. Note: All transport and game drives on road safaris will be in a minibus with six guaranteed window seats with English / Italian / German / French-speaking safari guide on a shared basis. During this safari, you will make a stop at Shetani Lava Flow for a brief history of this geographical feature which dates back to more than 500 years ago. This safari will take place at Tsavo East National Park, Amboseli National Park, and Tsavo West National Park in Kenya. In this safari, you can visit a Maasai village at an additional cost. Keitee Safaris is a safari operator that offers jeep, private, custom, and other safari packages in Kenya. The price for children under 12 years old is 330 EUR.